In “Snow Leopard: Party like it’s 1998” there’s an attempt to quell the outcry of Mac users for Apple dropping PowerPC support in Snow Leopard by recalling the late Nineties transition from the Motorola 68×00 to the PPC machines. It is a good and praiseworthy idea but unfortunately, in the description there are a couple of major inaccuracies which undermine the effort. On October 17, 1998 Apple released Mac OS 8.5, the first operating system that ran solely on Macintoshes with PowerPC processors. As far as system software upgrades go, this was the end of the line for any Mac built before the Power Macintosh 6100, introduced in March 1994. Earlier Macs ran on some variation of 680×0 processors and were supported mostly via emulation in a PowerPC environment. Emulation works, but it also slows things down. By 1998, Apple decided it just couldn’t support 680X0 emulation for a number of reasons, but chiefly among them was speed. The Mac OS 8.5 was surely the end of Mac based on the 68k family of processors, but Apple kept on making and selling machines based on this hardware platform long after the release of the Power Mac 6100 in March 1994. 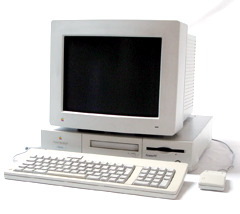 Macs such as the PowerBook 280 and the Quadra/LC 630 were launched during 1994 and even the following year, in the April and August of 1995 Cupertino introduced non-PowerPC models such as The Performa 580 and the PowerBook 190cs. And those Macs were not “supported mostly via emulation in a PowerPC environment”. It was the way around: Macintoshes based on the PowerPC chips had to use emulation to be compatible with the (operating) System (which was later called Mac OS), which was still full of 68×000 code. During the late Nineties Apple kept on slowly cleaning up the Mac OS code by “a PowerPC native, multi-threaded Finder” (does this ring a bell?) in Mac OS 8.0 and transitioning away from the old CISC CPUs by first limiting support to 68040 Macs with release 8.1.